In 2014, 3.2 billion people watched the FIFA World Cup. That’s massive - almost half the world watched the World Cup at some point. As a marketer, that’s a huge market you can be tapping into - a huge opportunity to see a boost in sales and lead generation if you take the time to put together a World Cup-themed contest. In this article, I’ll give you 10 World Cup contest ideas and 10 World Cup contest best practices to help you make the most of this massive opportunity. Need a hand creating a marketing campaign for the World Cup? Get started by talking with a marketing expert today! If your business is on the bigger side, consider giving away the ultimate prize - a trip to the next World Cup. Because this is an amazing prize, I’d recommend using a bonus entry contest to incentivize entrants to share. Create a sweepstakes with a form field asking your entrants to name their favorite player! Put together a prize of World Cup-related merch (like jerseys, banners, and more) and give that away to your entrants. Add a form field to your contest that gets people to share their favorite World Cup moments. At the end, pick your favorite - or get your fans to vote! If your target market is the football-playing type, get them to enter a photo contest by sharing a photo of their own team. If you’d like, allow voting to incentivize friends and family to participate, too. Create a brand-related World Cup hashtag, and run an Instagram hashtag contest to get your fans and followers engaged. Put together a photo contest asking your customers and fans to show you how they celebrate the World Cup. Get people to upload photos of their viewing parties, them in their jerseys - anything that shows you their World Cup spirit. Football fans are diehard fanatics. Give your fans the chance to win their favorite player’s jersey! This is a great prize idea because you’ll probably be able to afford to give away multiple jerseys, meaning more entries to your World Cup contest. Give away an all-expenses paid viewing party to your winner - include drinks, food, and maybe a few pieces of World Cup merch. This is an easy contest to enter, as your entrants just need to name their favorite team to win. To ensure your contest has the best chance of success, you need to follow these 10 best practices. The greatest idea will be a flop if you don't set your contest up to win! The best way to ensure you have World Cup contest entrants is by activating your mailing list. Though this might seem counterintuitive (as you’ve already gotten their lead information), mailing your contest to your list of subscribers is a great way to remind them of your brand, highlight new products, and get them re-engaged if they haven’t interacted with your business in a while. 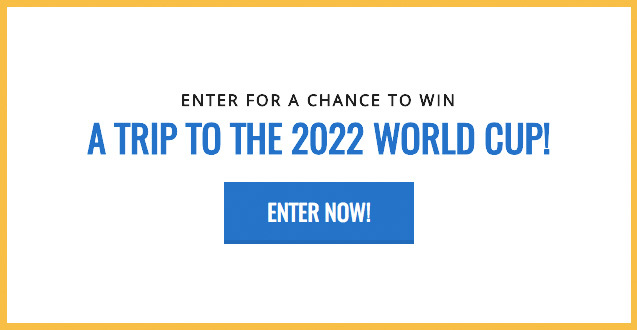 Create an engaging newsletter that quickly references the World Cup, explains your contest, and highlights a few of your prizes. Getting subscribers to enter your contest is a great way to get more lead information from them, as well - more on that later. 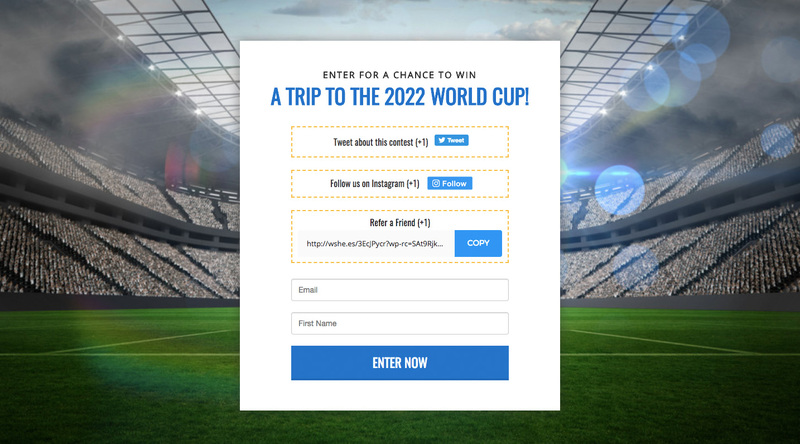 It’s great and all if you’ve put together an awesome, World Cup-themed prize package, but you want to make sure people that enter are interested in what your company has to offer - otherwise, you’re generating a bunch of leads that probably won’t end up meaning much to your business. To do this, create a prize package made up entirely of your products, or make sure your product is at least a central piece of your prize. If you really want your World Cup contest to soar and succeed, the number one best thing you can do is take advantage of Facebook Ads. In our experience (and we have a lot of it), Facebook Ads are hands down the most effective way to reach high-quality, engaged leads. Use Facebook Ads’ powerful targeting tools to pinpoint segments of people you know will be interested in your product based on interests and demographics. If you’re inexperienced, feel free to book a free one-on-one call with one of our ads experts to see how we can help. For a complete guide to how to use Facebook Ads for contests, check out How to Ensure a Successful Online Contest with Facebook Ads. If you find your website is a relatively strong, steady source of traffic for your business, you can leverage that traffic to drive more people to enter your World Cup contest. Use some sort of popup (I find exit, entry or slide-in popups work well) or opt-in bar to alert your entrants to your contest. Add a button to your popup that directs people to your contest page. Doing this helps push people who are already interested in your product to a page where they can turn into quality leads for your business. Make sure not to add your popup to pages that are integral to conversion like your ecommerce checkout page - you don’t want to pull people away from converting. Though your headline, World Cup contest page, and traffic sources are all important, the element of your contest that most heavily determines whether or not people will enter is your prize. Make sure you provide ample details to potential entrants to get them to enter. First and foremost - a detailed list of prizes. If you have a prize package, list out each item in the package using bullet points. Next, consider including a high-quality image of the prizes you’re offering to the winner. Finally, add your prize to your headline - it’s the first thing people read when they visit your page, and you want to hook them immediately so they enter. In addition to your website, social media can be a powerful way to market your contest to fans and followers. Schedule a couple social posts to go out on Facebook, Twitter and Instagram, alerting people of your World Cup contest and letting them know what prizes they can win. Get your designer to create a set of social images (featuring your prizes) that capture followers’ attentions. On Instagram, consider adding your contest link to your bio so people can easily enter - the platform doesn’t support hyperlinks anywhere else, and you want people to be able to enter easily even on mobile. If you want to ensure you’re reaching new potential customers, a great strategy is to partner up with another brand to run your World Cup contest. Find a brand with a product or business that complements yours (for example, if you’re a gym, you might want to partner up with a spa or masseuse), and consider running a contest together, sharing all of the leads that enter. This strategy is awesome because, at the very least, you benefit from reaching each others’ email lists. This means new, engaged leads coming to both of your businesses. On top of that, you can split promotional costs and put products together to make an epic prize package. One mistake I see companies make all the time is not sending a follow-up email to their contest entrants. They collect the leads, and that’s it - but that’s not the most effective way to drive sales from your contest, and isn’t that what you want? The value in collecting leads from a World Cup contest is that they’re warm and engaged, as they’ve just interacted with your business. Send a short email blast to all of your entrants after the contest is over. Include a call-to-action that pushes them towards a store page and provide them with a discount code, or inform them about a special World Cup limited offer that you’ve put together. Reaching out soon after your contest ends maximizes your chances of turning these people into sales. Though this won’t directly impact the success of your World Cup contest, it can have a massive effect on your post-contest marketing efforts. Adding a single form field to your contest entry form that helps you segment your entrants can greatly assist you in personalizing your future marketing communications. For example, you might ask an entrant if they’re interested in men’s or women’s products, or which of your product categories they’re most interested in. Doing this allows you to create segments based on their answers, making it possible to send emails that are more targeted based on your entrants’ interests and preferences. Though you could get away with running a sweepstakes or photo contest for your World Cup-themed promotion, running a bonus entry contest allows you to incentivize sharing. Here’s how it works. Your entrants enter as they would with any other contest, and then complete bonus actions (like visiting a certain page, following you on Instagram, or getting a friend to enter) to gain bonus entries to your contest. This helps your contest get rolling and can quickly increase your social following. Hopefully, this article has given you a headstart on putting together a championship-winning World Cup contest. If you have any questions, feel free to reach out in the comments below!